Sofas and Stuff have a wide range of stunning Red sofas handmade in Britain. Browse our vast stock in showrooms or online. Why not order a free sample pack online to create a perfect Red sofa. Whether you call it cardinal, crimson, ruby or rose, an opulent red sofa is the ultimate item for cosy interiors. 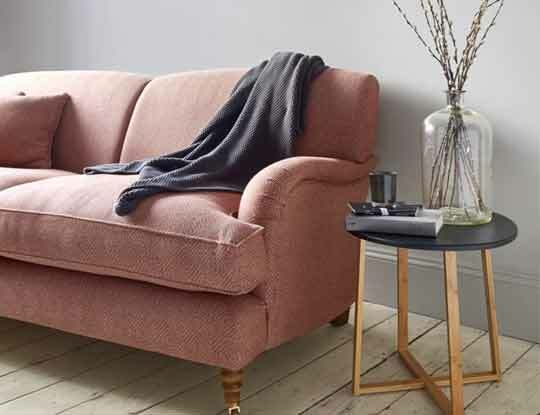 Imagine your home with the addition of a red chesterfield sofa, oozing statement style, or perhaps a perfectly practical poppy-red sofa bed for surprise stopovers. Squashy red corner sofas are just the ticket for family time or choose an armchair in cranberry tones if you fancy a splash of colour. Whether you’re looking for contemporary sofas or a more traditional style, there is a shade of red sofa to suit all interior tastes. All of our bespoke, British sofas can be covered in your favourite tone, with expert advice in abundance in both our showrooms and online. Red sofas seem to be an everyday part of life in the 21st century, however this was not always the case. Skip back even just 30 years and the good old folk of Britain would have cast some rather strange looks towards anyone suggesting them buying a red sofa. Fast forward to present day, and we are happy to inform you that red fabrics are some of the most common that we sell. We More and more people come into our stores in search of that statement piece of furniture. In fact in 2017 one of our most popular red corner sofas, was the Hambledon in a red check and stripe. If you are stuck for design ideas, why not pop into one of our sofa stores and browse our huge range of red sofa fabrics. Some of which are classy and understated, others are loud, bold and will certainly leave an impression on even the most fashion conscious guest.